Well, it’s Sunday in Port Moresby and apart from hitting the gym and then loafing around the pool I don’t have too many obligations today. Hence, I have time to write a post. 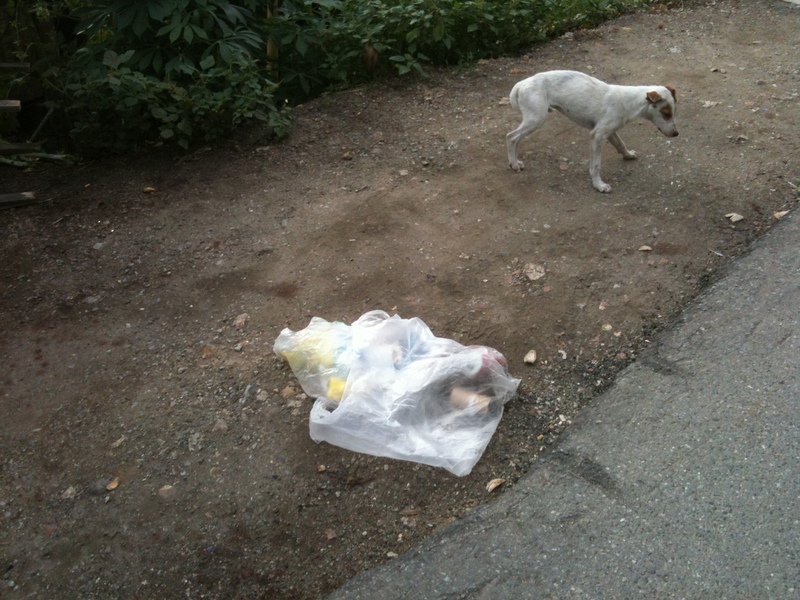 Today’s is about stray dogs. 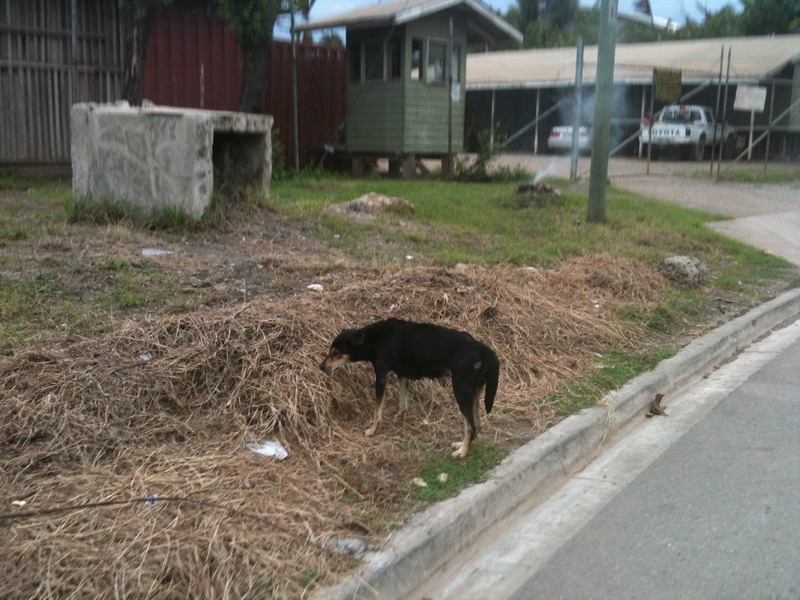 Port Moresby is the stray dog capital of the world. Forget everything you know about pet ownership. None of that applies here – at least not for 99% of dogs that I have seen. No leashes, no kennels, no doggy poop bags, no neutering, no microchip implants, no tags, no registration, no collars, no doggy treats, no purebreds and no dog pound. No walking the dog and certainly no doggy day care. 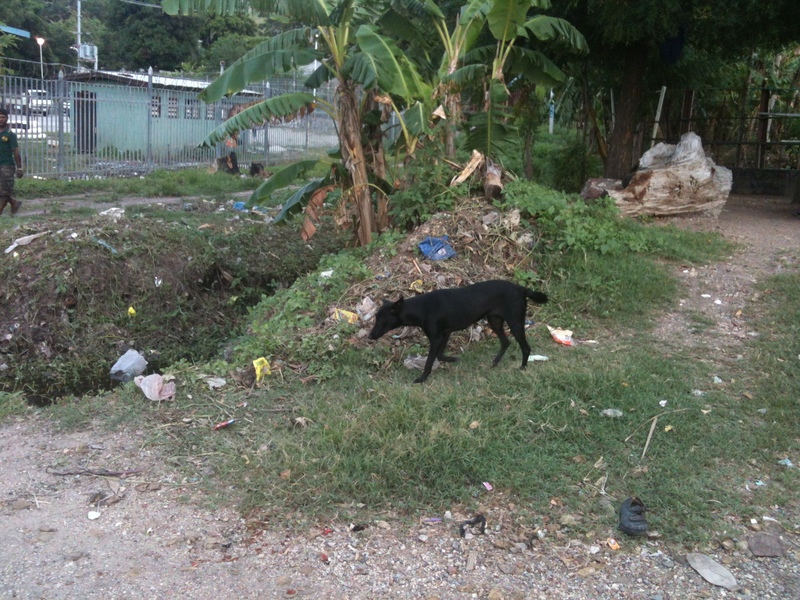 In Port Moresby, dogs roam the streets freely, eating garbage and scavenging whatever they can find to survive. 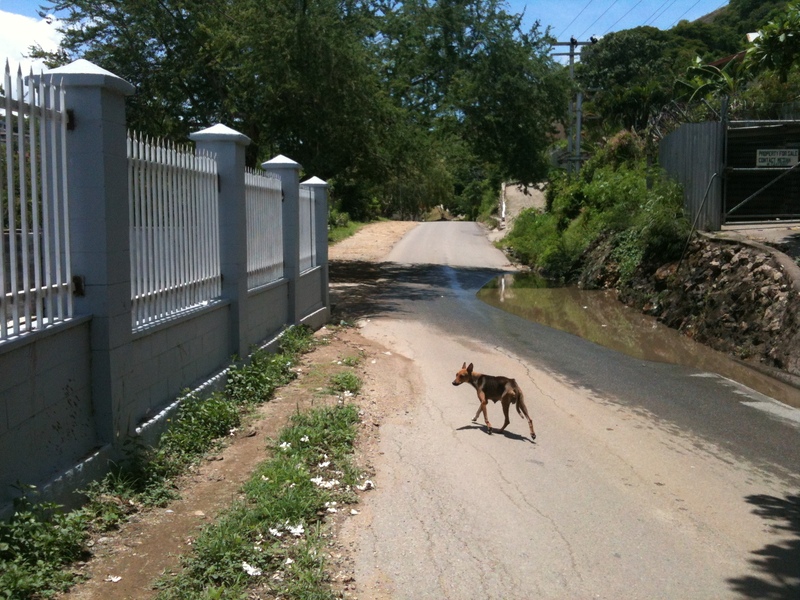 When I walk around the streets, I am in constant fear of being attacked. Some of the members of my walking group have been bitten by these dogs on occasion. 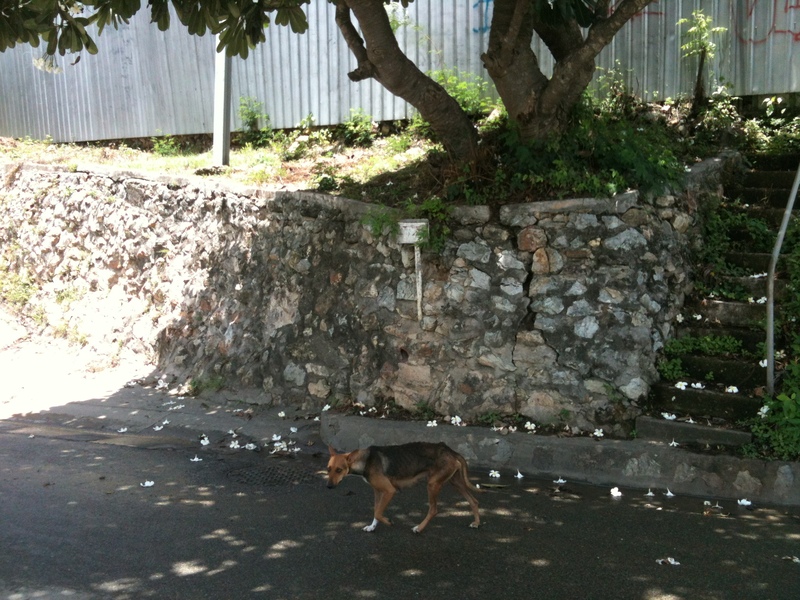 Fortunately, rabies is not really a concern here (see my post on vaccinations from a few months back). I’m sure in many cases, the dogs have an owner. They probably belong to the people in the house around the corner. But there’s no way that anyone could ever know that unless they’re familiar with the neighbourhood. 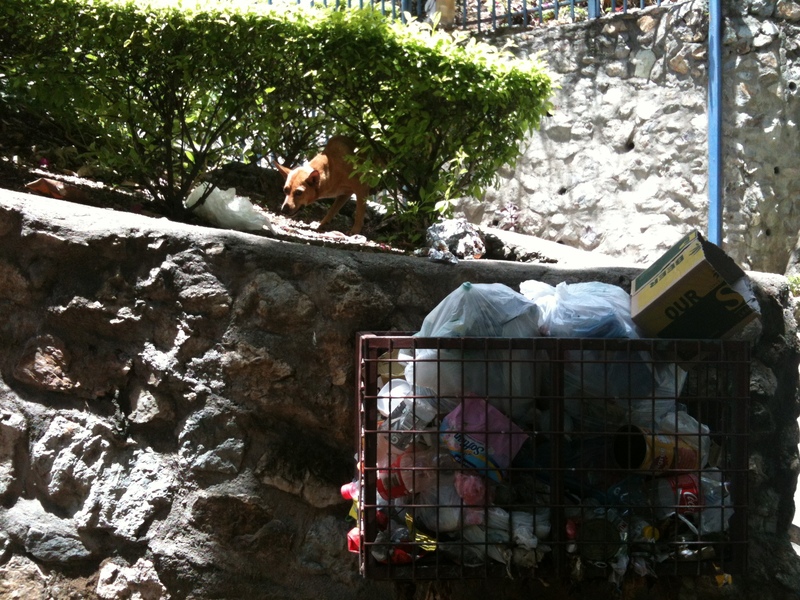 To the untrained eye, they appear (and behave) very much like stray dogs. 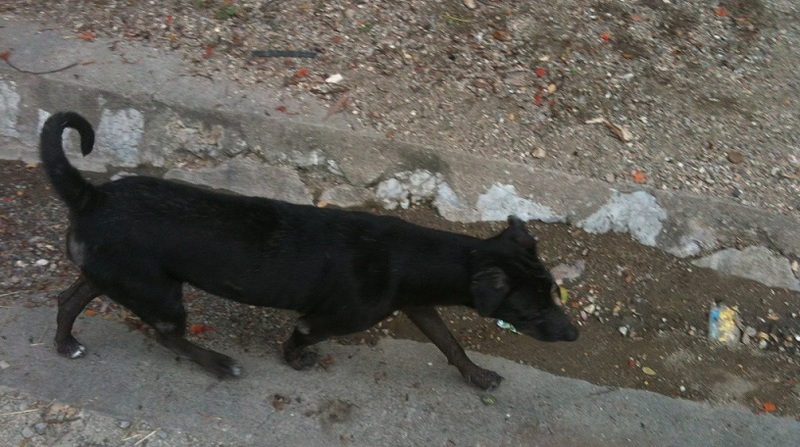 Many of the dogs around town are undernourished and not cared for. All of the females seem to be either pregnant or lactating. 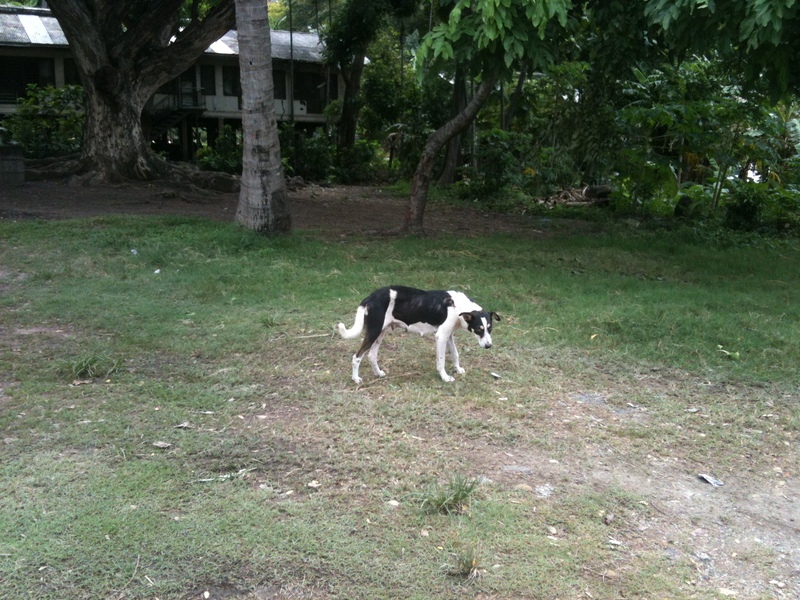 The dogs of Port Moresby usually just laze about, ignoring the humans around them. 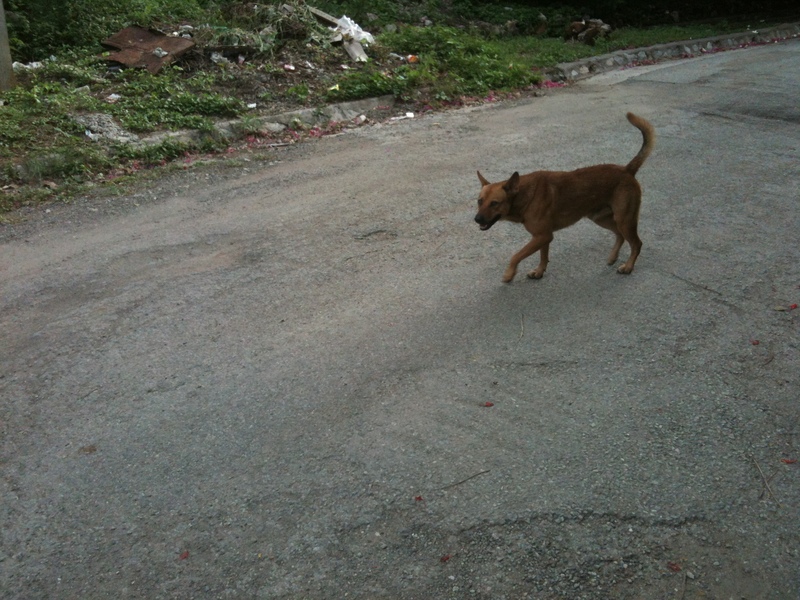 Interestingly though, I discovered when trying to photo graph some, that they are extremely wary of being approached. As soon as I try to a photo, they flee. I guess they’ve learned that humans taking an interest in them rarely ends well. This fellow eyed me suspiciously as I reached for my camera. 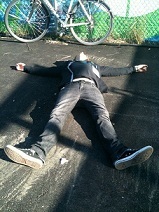 As soon as I approached him for a photo, he took off like a shot. 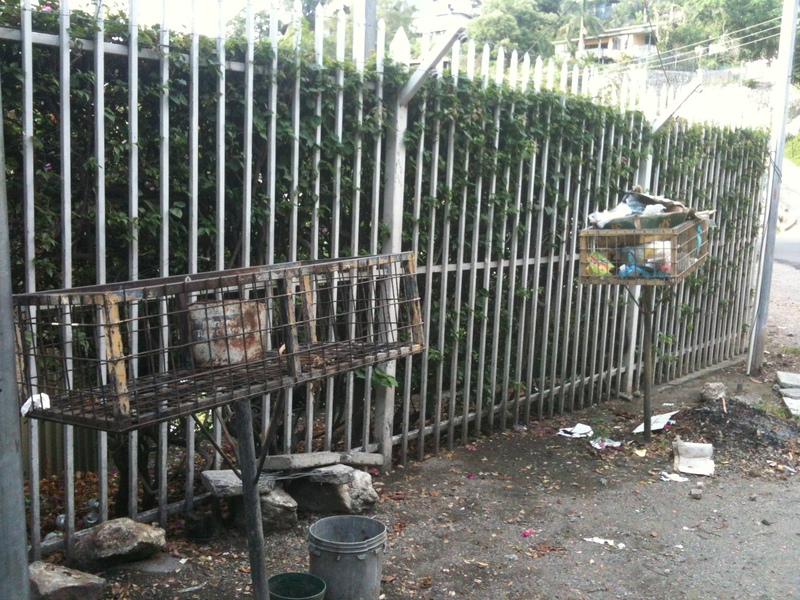 When I first arrived, I noticed these odd wire baskets suspended in the air on metal posts. When I asked about them, I was surprised to learn that they are garbage bins. 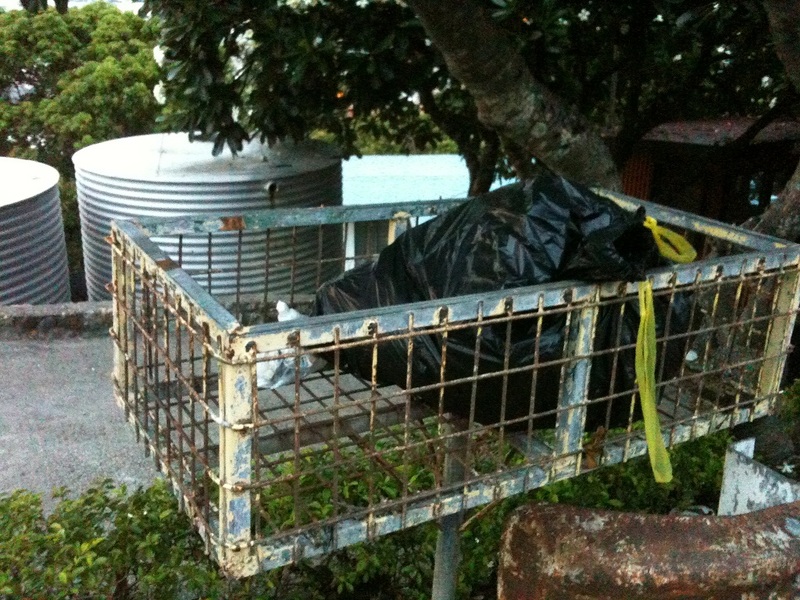 In the wealthier neighbourhoods, where there is a garbage collection service, each house has one a basket like this. 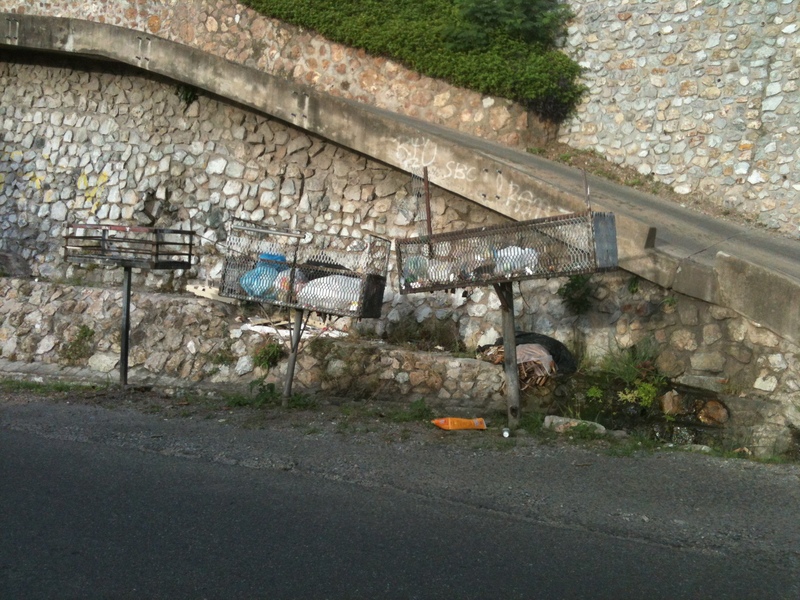 No doubt this design is superior in terms of preventing back injuries for garbage collectors, but of course the reason for the elevated garbage bins is to keep the stray dogs out. This cute little fellow was lurking in the bushes as I walked past. 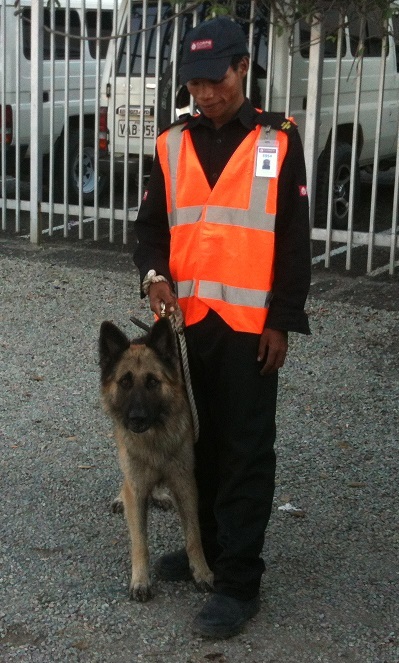 Of course, to every rule there are exceptions and one does very occasionally see a dog that is on a leash or in a kennel. I think this German Shepherd saw me and thought I’d make a nice lunch. 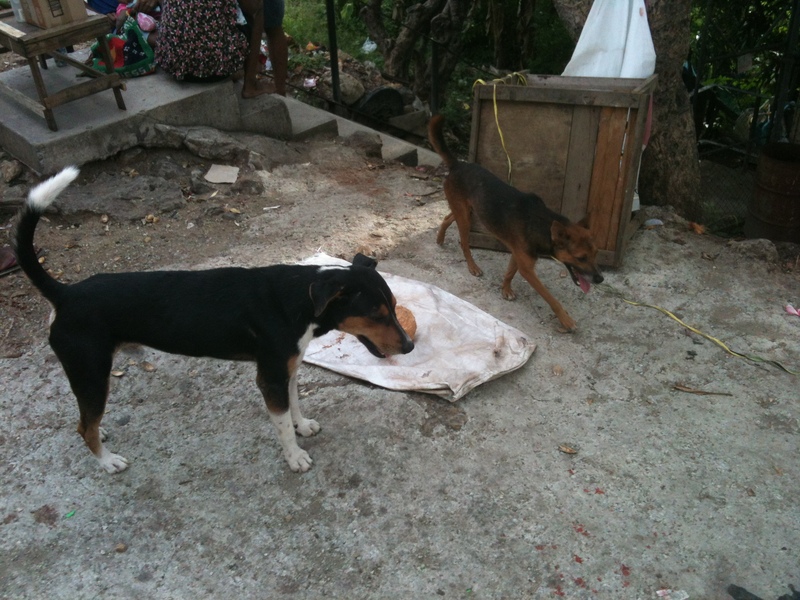 Those dogs living in compounds as guard dogs are generally very well treated and cared for. 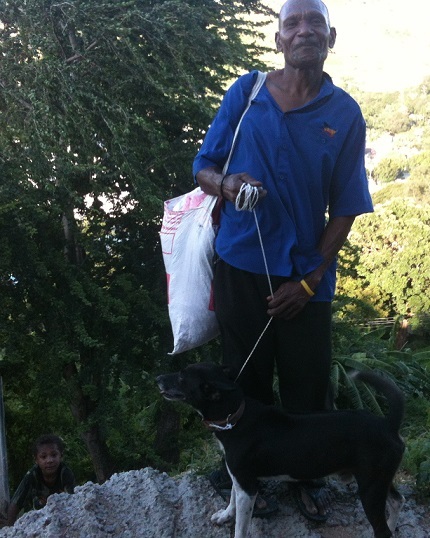 I saw this chap walking his dog when I was on my way to the gym the other day. 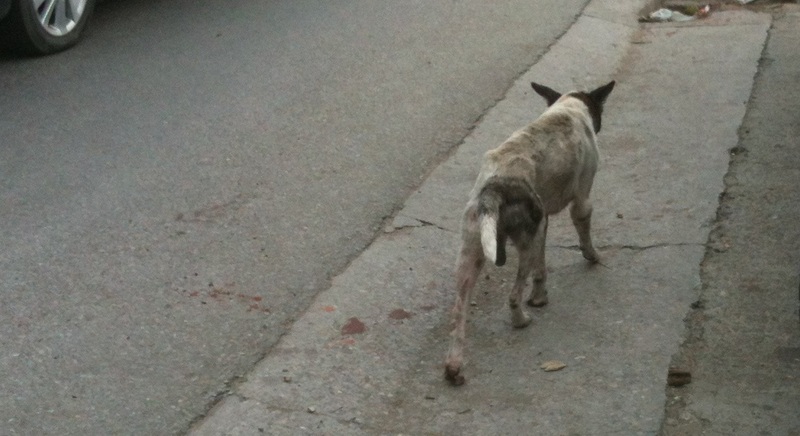 It is the first time that I have seen a dog on a leash since I arrived. Good question. No doubt there are efforts underway. There is an RSPCA here and they have their work cut out for them. In a society where 70% of women are subjected to violence during their lifetime, it is not surprising that the protection of animals is neglected. 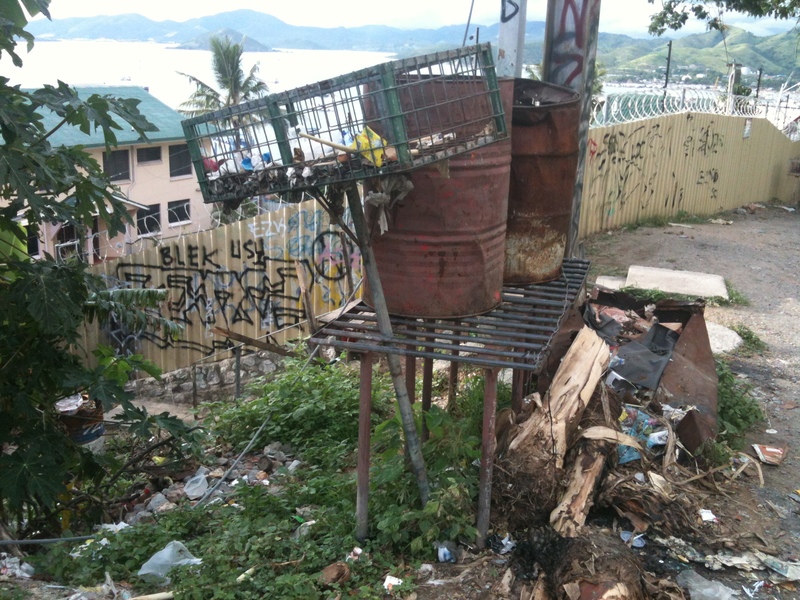 Health care and education are major struggles for governments in PNG. Do we fix the potholes in the roads, or protect the environment instead? There are so many competing priorities and very limited resources. 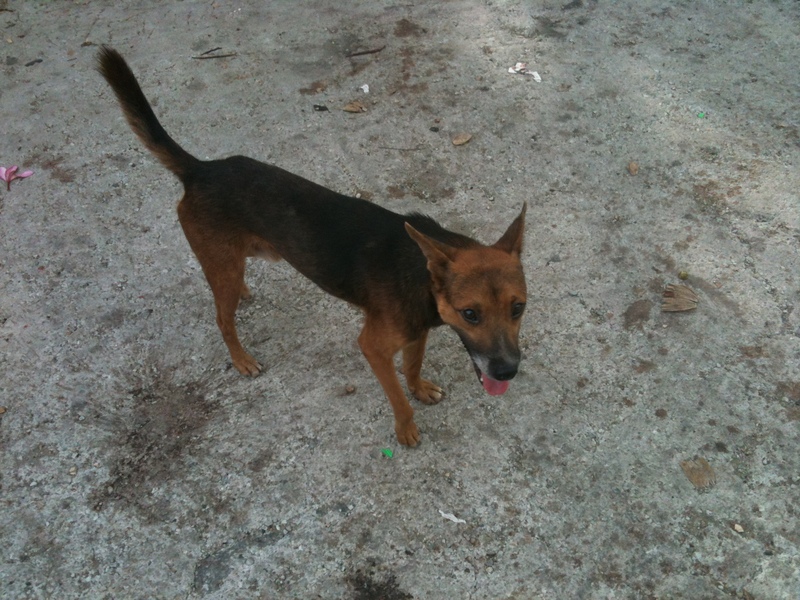 Regulation and registration of pets is way further down the list of priorities. The key to development is to make small steps in all of these important areas and improve things little by little in every domain. The fact is that the order that we enjoy in the developed world is not ‘normal’. It is the result of millenia of scientific discoveries, institutional development, cultural values, rules, laws and enforcement. It doesn’t just happen. It requires a huge, coordinated effort over an extended period of time. The natural order of the world is quite the opposite – plants scatter seeds in the wind with no means of knowing which will take and which will land on unfertile soil and wither. 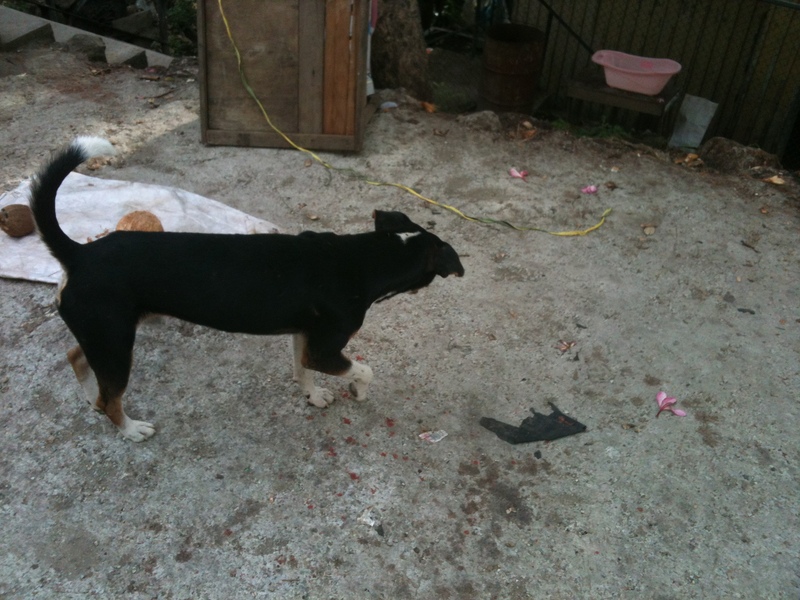 Dogs breed with no means of knowing whethere there will be food for them to eat. It results in chaos, disorder and death. And of course, it’s not limited to the animal kingdom. In the developing world, people also enter the world without food security, and even in 2013 there are people without enough to eat. Compared to the structure that we know in the developed world, where population growth is controlled and the food supply is managed to ensure that no one goes without their basic needs, this seems barbaric. But that is exactly what happened everywhere before people became educated and organised, and in the parts of the world where people are not educated and organised, this still happens. In Africa and Asia in particular, there is still a large portion of the population without access to education and contraception – usually because too poor to access it, or (saddest of all) there are social and religious boundaries restricting the use of contraceptives. The tragedy here is that that leaves people reproducing with no means of knowing whether there will be a food supply to meet the demand. There is no control and so people starve. But it doesn’t have to be that way. I dream of a world where instead of nations racing to see who can overpopulate the world fastest, we have fewer people – all of whom can enjoy a greater quality of life. A world where everyone is educated and productive and can benefit from their toil and live a good life without needing to resort to violence or theft. I may be naive but I think that this is achievable. In the immortal words of John Lennon: “Imagine”.